키엘, 독일의 노르딕 호텔 암 키엘러 슐로스 | 호스텔월드에서 예약하세요. Located in the heart of the old town of Kiel, the Nordic Hotel am Kieler Schloss welcomes you with modern flair and comfortable rooms. It is the ideal place to stay for your sight seeing trip, and being close to the seaside it is only a few steps away from the promenade. Have a coffee in our lobby with a view of the Danische Strasse with its exclusive boutiques. 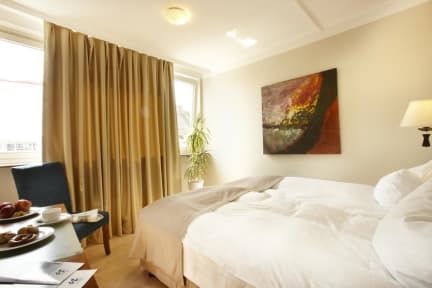 The Nordic Hotel am Kieler Schloss is centrally and quietly located in the heart of the city in immediate proximity of the Kiel palace and the old market. Despite the very central situation in the heart of the city, it lies removed very quietly in a traffic-calmed street only 350 m from the Ostsee- und Sweden quay. Interesting museums and exhibitions you find here: Kunsthalle Kiel (Hall of Art), Aquarium and Kieler Schifffahrtmuseum (shipping museum). The hotel owns 29 single rooms, 6 double rooms and 3 studios. 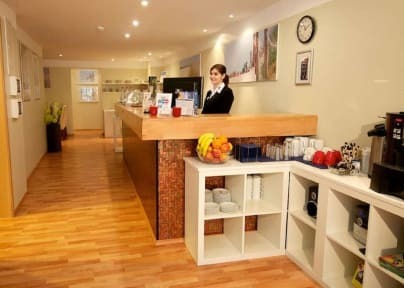 The comfortably furnished rooms with bath/shower/WC, TV and radio promise a pleasant stop in quiet atmosphere. Breakfast not included - 8.50 EUR per person per day. No 24hour Reception but late arrivals are allowed with prior arrangement.